There’s fewer franchises more well-known or more instantly recognisable than Pikmin, and for good reason – it’s carved out and attracted a niche fanbase for its cute-creepy aesthetics and its fast-moving strategy gameplay, and while we haven’t seen a full title since 2013, there was little reason to expect Hey! Pikmin to disappoint. As a fan of the series who arrived relatively late in the game, I’m of the opinion that this latest iteration of the franchise is a respectable spin-off – it gets the job done and looks about as good as it can doing it. 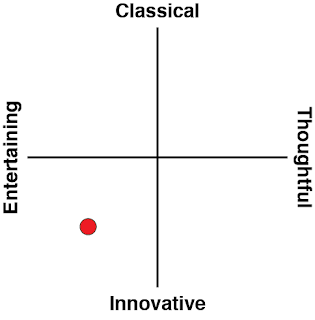 That’s a bit of a double-edged sword of a compliment, but it’s true. There’s a lot that’s great about Hey! Pikmin, most of all the titular plant buddies that the series is aptly named after. However, this title has been a huge departure in terms of mechanics and potential complexity from the original games, which can be off-putting for some and initially perplexing for most. The basic premise is the same – you control the bumbling space salaryman, Olimar, as he crash-lands on a faraway planet and enlists the help of adorable locals in the form of Pikmin to get himself back to his family. These Pikmin will faithfully do your bidding, and it’s all because of the whistle that you carry around; they’re nuts for anything exciting, whether it’s a shrill whistle, a rustling in the bushes, or something shiny. The developers, Arzest, have eschewed the old strategy gameplay where you control hordes of Pikmin to accomplish multiple simultaneous objectives across spanning an entire map for a puzzle-platformer. Hey! Pikmin feels like much lighter affair because, well, it is. Swapping the top-down approach of the "proper" Pikmin games for a typical 3DS platform style dual-screen is fun, and is interesting without reinventing the wheel. It certainly results in a new way to play the game, with more independence and mobility offered to good ol’ Olimar, who used to act as more of a tactical scarecrow than anything. The essence of the old gameplay is still there, however; you get a lot of mileage out of your planetside mates as Olimar, and they’re excellent at stealing the show. There’s five different kinds of adorable Pikmin that you can throw at various objectives in the game. There’s the Red ones who have an affinity for arson; the Blue ones who love to swim; the Yellow ones who are resistant to electricity and leap the highest by way of their tiny frame; Grey ones who exist solely to be thrown into things that the rest can’t break; and the Pink ones who can actually fly. They’ve all got their various roles to play by virtue of their unique skills, and knowing which ones to use in different situations make a world of difference when it comes down to the meat of the game - collecting as much shiny stuff as possible. Your overarching goal is to collect huge amounts of a material called Sparklium, which is present in a bunch of objects that have been left behind as relics of humanity’s bygone era. From old NES cartridges (logged by Olimar as ‘Inevitable Tragedy’) to Casio watches, you’re on a mission to find them all and turn them into spaceship parts so you can get home. It’s the small touches in Hey! Pikmin that really make all the difference, ranging from the entertaining log entries for various items to the cute cutscenes that play in various levels when you discover a crop of Pikmin mucking about in their natural habitat. The real charm doesn’t come from playing a potato-shaped astronaut; it’s not called Hey! Olimar, which makes me wonder why they expanded his role at all in this new iteration. Instead of being a bit of a sad sack, Olimar gets more of a starring role in this title by virtue of the fact that he now has a cool little jetpack. This means that you can fly short distances and navigate ledges and gaps that your Pikmin are otherwise unable to, allowing for a couple of hidden items to be reached with reasonable ease. However, the key thing to note is that your accessory comes at a price: as above, to get to those hidden places, you’ve got to leave the Pikmin behind. To me, that seems a little counterintuitive in terms of engagement; Olimar as a whole is a milquetoast character by comparison to the creatures he encounters. While it was surprising change of scenery to have him venture off by himself, the fact of the matter is that he’s about as useful as a potato without the help of the Pikmin. Yes, he can scoot his way to a ledge or pick up some Sparklium that’s just out of reach, but he hasn’t got the capacity to solve any of the puzzles because he really can’t do anything else other than putter around. The Olimar-centric sections of the levels are small, but they break the immersion a little just by virtue of being there and being clunky. 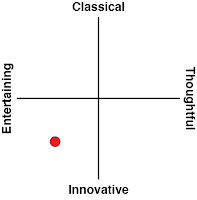 The other parts of the levels, however, are nearly flawless in what they set out to do. 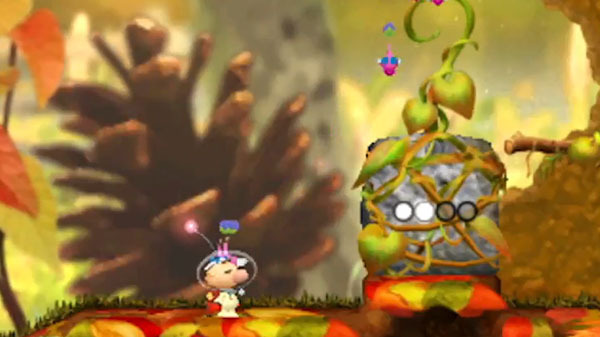 Each Pikmin has a thing that it does, and switching between them at the drop of the hat is an essential mastery if you want to do well in some of the later levels. The set-up of the levels is ingenious in the sense that each presents like a well-sequenced picturebook - you can bypass whole sections of a level before finding a secret door or a trampoline that ricochets you and your Pikmin from one screen to the next, back to the starting point but just at a different height with its own different puzzles. Hey! 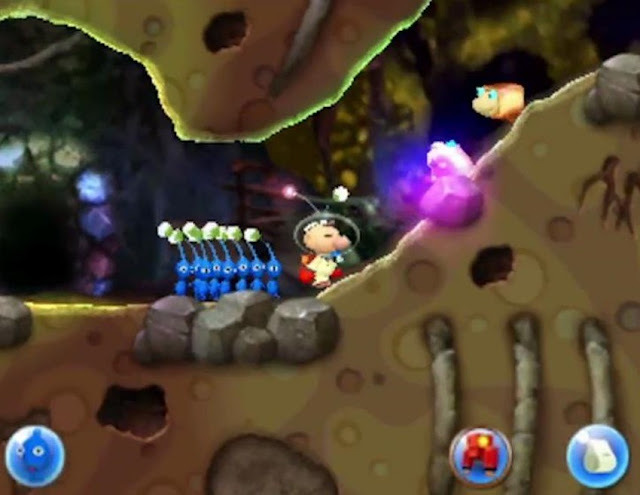 Pikmin really makes use of the 3DS and its dual screens in levels like these, and keeping an eye on both is essential to not only tracking enemies to be dealt with, but also to ensure that you’re on the ball when your puzzles have moving or destructible elements. It’s easy to get locked into just looking at the touch screen when that’s your main source of controlling the Pikmin via what looks like vigorous flinging and whistling, but you’re missing out on a key part of the experience if you don’t look up at least once in a while. My one and only gripe about the way the game has been designed for the 3DS is the fact that your A-B-X-Y buttons are useless. Even when I was well over halfway into the game, I was still finding it hard to remember that in order to advance text on the screen or get to a different menu I had to use my stylus to tap the screen. Like playing as Olimar, navigation was clunky and a little counter-intuitive in terms of moving between various basic screens like the post-level summaries or just simply letting the game know that you’ve read an alert. Overall, Hey! Pikmin is a good offering to the franchise considering its status as a spin-off. It may not play at all like the original Pikmin, but it’s a close enough relative that taking the reins feels natural. The ease of which you can get into Hey! 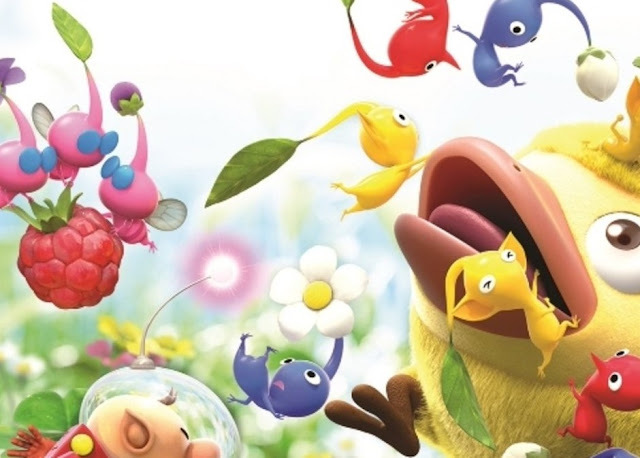 Pikmin is both a blessing and a curse - it doesn’t do a lot to distinguish itself as a title, which is fine, but that also doesn’t make it particularly memorable. The difficulty curve is sensible without being onerous, and it provides just enough challenge to keep you wanting more without getting frustrating. Fans who want something with a little bit more teeth will have to look elsewhere, but if you’re getting Hey! Pikmin with the expectation of a game that will chew you up and spit you out, I’ll have to question your sanity.